An artist's illustration of green crystal rain, made up of the mineral olivine, falling onto the infant star HOPS-68 from its surrounding cloud of gas and dust. This story was updated at 1:56 p.m. ET. A glittering crystal shower of green, emerald-like gems is falling like rain onto an infant star from the clouds surrounding it, a new study finds. The discovery may explain why similar crystals have been seen in the comets of our solar system, researchers said. This image taken of the Orion nebula by NASA's infrared Spitzer Space Telescope shows the location of the infant star HOPS-68, which a new study reveals is subjected to a crystal rain of olivine minerals. "If you could somehow transport yourself inside this proto-star's collapsing gas cloud, it would be very dark," researcher Charles Poteet at the University of Toledo in Ohio said in a statement. "But the tiny crystals might catch whatever light is present, resulting in a green sparkle against a black, dusty backdrop." Astronomers are still researching the origin of these crystals, but the most likely culprits are jets of gas blasting away from the proto-star. "You need temperatures as hot as lava to make these crystals," researcher Tom Megeath of the University of Toledo said in a statement. The crystals were detected before in the swirling planet-forming disks that surround young stars. The discovery of the crystals in the outer collapsing cloud of a proto-star is surprising because of the cloud's colder temperatures, about minus 280 degrees Fahrenheit (minus 170 degrees Celsius). "We propose that the crystals were cooked up near the surface of the forming star, then carried up into the surrounding cloud where temperatures are much colder, and ultimately fell down again like glitter," Megeath said. 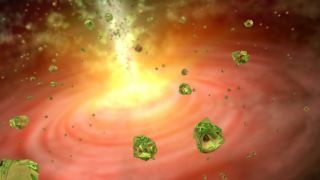 An artist's illustration of the baby star HOPS-68 as a green crystal "rain" of olivine falls onto the star from its surrounding disk of material. The new study may help scientists explain why comets, which form in the outskirts of our solar system, were seen to contain the same type of crystals by NASA's Stardust and Deep Impact missions. "This process may result in materials that require lots of heat to form being transported to the cold outer reaches of a young disk," Poteet told SPACE.com. "In our old solar system, there is heat-processed material found in cold comets. Our data suggests one way you may get heat-processed material into the cold, outer reaches of a planetary system." Comets are born in regions where water is frozen, much colder than the searing temperatures needed to form the crystals, approximately 1,300 degrees Fahrenheit (700 degrees Celsius). The investigators suggest the crystals formed near the sun, then were blasted outward, mingling with the other, frigid materials that went into comets. The scientists detailed their findings in the May 10 issue of the journal Astrophysical Journal Letters.